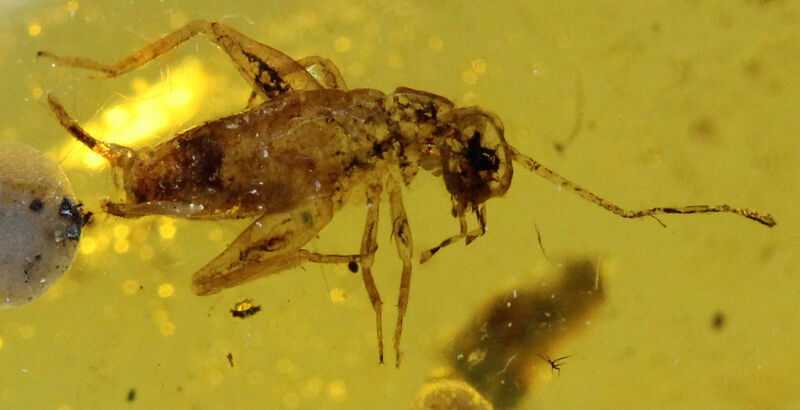 Enicocephalidae in Burmese amber, if anyone was curious ;-). Ha! I first read this as being "Lightening for Amber photography" and thought hum, this should be an interesting. A real lighting challenge...that's a tough subject to capture. This is just my trial and error thinking...I would cut off the back light and try illuminating the piece with halogen spot lamps (just because I have those) from two sides. Then I would try a ring light from above, but reflection of that source might prove a vexation. Good luck and have fun. Please post your results. Decided that the microscope was just not working for focusing and such, so switched back to a macro lens. Some are better than others, but having some success with a large LED light and a small flexible arm microscope light. This is a shot of a cricket. having some success with a large LED light and a small flexible arm microscope light. This is a shot of a cricket. I think this one is very nice. What camera settings are you using? Macro lens on manual focus. Used pretty standard settings with the Cannon Eos software, just made little adjustments to the exposure and depth of field till it looked right. Thanks, the depth of field, always a concern with macro attempts, looks as good as could be hoped for in your shot. I think it's a successful effort on a difficult subject.